The new security doors at the Knights of Pythias Building on Lyon Street downtown. 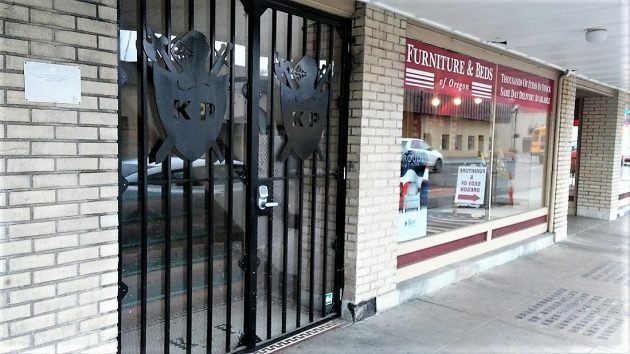 The security gate at 230 Lyon St. downtown was installed to keep trespassers out, and now the building owner is asking the city council for permission to let the doors swing out. Here we have a reminder of two things Albany has plenty of — vagrancy and rules. The city council is dealing with part of this at a work session on Monday. The agenda includes a request by Daren Clowser, owner of the former Knights of Pythias Lodge Hall at Lyon Street and Third Avenue, for a “license to occupy public right of way.” This is to accommodate the doors he had installed at the foot of the stairway to the residential top floor. Because of the geometry of the entrance, the doors could not be made to swing inward. So they extend on to the sidewalk when somebody walks in or out. The sidewalk is 12 feet wide, leaving plenty of room for people to pass the open doors. The result was damage including graffiti and even human waste. “It got to the point that the female tenants were scared at night to walk the hallways alone,” Clowser wrote. Land use? Yes, changes on the outside of the former lodge, built in 1913, are subject to applying for “historic review” and getting the city’s OK.
UPDATE: The city council voted 6-0 on Monday to approve the “license to occupy” that the owner needed. Seems there’s a regulation for pretty much everything in this city. The building owner has taken the initiative to protect the safety of his tenants but run afoul of a “beauty” rule. If the intent is to make the area vibrant, allow a building owner to protect his tenants at his expense. If not, well it’s gonna cost public money, but the tenants will be gone. If the owner got a $10,000 grant last year for building facelifts, he should be well aware about requirements on historical buildings, and maybe just figured the door didn’t count. It’s hard to imagine that any downtown building owner was not aware, because the regulations have been around for decades. Next, someone probably filed a complaint, because city staff do not go patrolling around looking for people to ding. And here is what the staff memo says IN THE VERY FIRST LINE OF THE BODY OF THE STAFF REPORT. So Mr. Editor, why for heaven’s sake, didn’t you report the staff recommendation? No news day? Who pays for the injuries that pedestrians receive from walking into a suddenly opening door? Indeed. It should be the same people who cover the injuries from Pushing on doors marked Pull. On a quick glance over as I drove by, I thought nice design! The “shield” is great. Big but it stands out. Who knows….in 50 years it might be protected by city code and the template for all the others. The sword/shield/helmet ar a nice tie to the Pythian heritage.